Because Japanese dishes tend to use so few ingredients, it’s very important that each ingredient be of the best quality available. It may seem basic, but since dashi is the basis of most dishes in the Japanese culinary repertoire, it’s perhaps the most important component to get right. 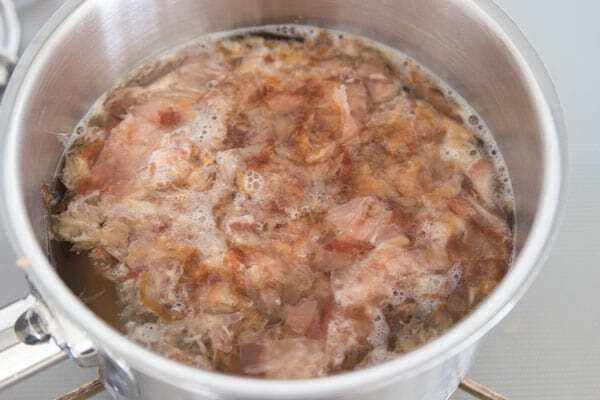 While there are many different ways of making dashi that vary by region, and even by cook, I think most will agree that making it from scratch will get you the best results. Thanks for sharing the Dashi recipe. I am always concern about the high sodium/ salt content in commercial dashi, this recipe is very useful. Thanks again! “Dashi” in step 2 should probably read “kombu”? 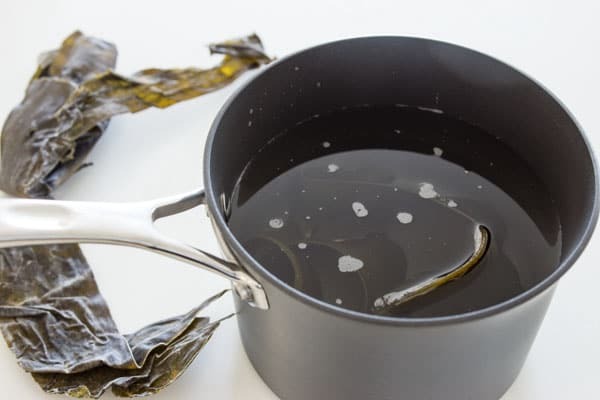 What do you generally do with the kombu after you are done making dashi? It’s usually cooked with soy sauce, mirin and sugar until tender and most of the liquid has evaporated to make tsukudani. It’s a very salty condiment eaten on top of white rice. have you ever heard of “nihondashi”? 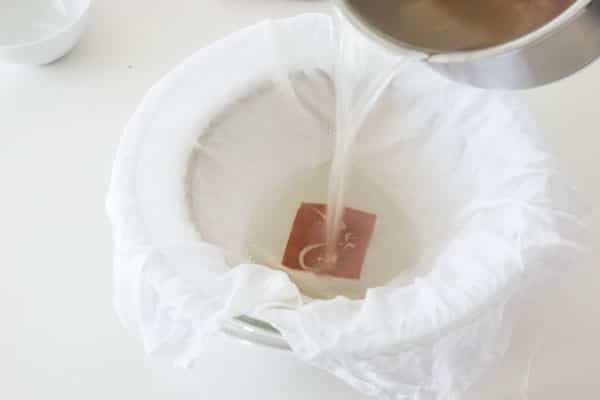 i learned that it’s a second soak of the ingredients to make a lighter dashi… so you would do the kombu in a second liter of water, bring to boil and then reintroduce the used katsuobushi, steep and strain again. the result is much lighter but still has flavor. could be good for light miso’s and clam soups. Hi Eagle, I think you might be referring to “nibandashi” which literally means “number two dashi”. 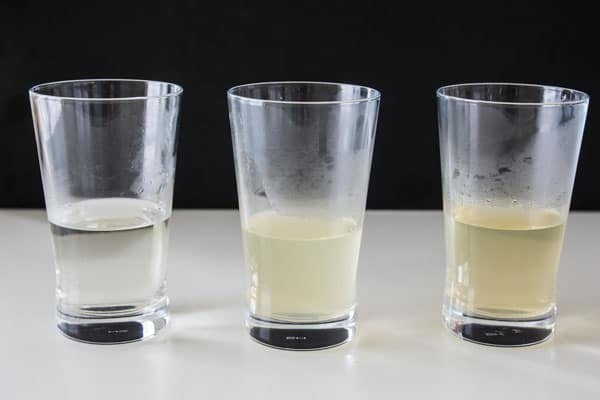 It’s a great way to get the most of your ingredients, the problem is the ratio of of kombu and katsuo to water changes quite a bit (i.e. you need a lot more relative to the water), so it’s not especially practical unless you’re making a very large quantity of ichibandashi. Yeah, maybe that’s it. Sorry, my Japanese is limited to food and still it’s not so good ha. Just wanted to throw it out there as a way to get the most out if everything. How large of batches do they usually do to do both processes? So this Dashi can be used in place of say chicken stock? In any dish? Hi Ernst, it’s obviously going to taste different, but yes, that’s the idea. Different is good! If different is full of umami I’m all in. Different as in it won’t taste like chicken, and it won’t be as rich given that there is no collagen or fat in the stock. That said, if umami is what you’re looking for it has boatloads of that. I often use dashi in risotto. I’ve actually made dashi (your “no” recipe) only used it for soup and braised fish. I’ll make some and use it for braised beef. No rules in the kitchen. Long time no comment. Sorry about that. This looks delicious, yet super easy. I didn’t realise you shouldn’t boil the ingredients. I will try it this way next time. Thanks! As usual Sensei, outstanding explanation & thank you so much for posting this. My mom never went into detail when cooking, so if I asked about dashi I’d get something like, “Boil kombu, add bonito flakes, use a pinch or so, whatevah. Now go stuff cone sushi.” Maybe it’s ’cause she was nesai from Hawaii. As someone who lives in croatia and has no way of getting katsoubushi short of taking a trip to London, do you have any idea if any more western ingredients could be substituted? Or maybe if another stock tastes similar enough to be able to be replaced in recipes? Thank you, this site is one of my favorite sites overall, though inability to get ingredients is driving me nuts. I have no idea where I can obtain these ingredients in my area yet I really would love to make my own from scratch! If you’re in the US, Marukai, and Mitsuwa are the two big Japanese grocery store chains and they both have an online store. There are also tons of regional chains, try searching for a Japanese market. Also, some larger asian markets will carry the ingredients as well, but your selection will be limited. There is an analogous ingredient used in Sri Lankan cooking called “dried Maldive fish”. It’s also skipjack tuna except it’s just dried in the sun and it resembles little wood chips. It’s different from katsuobushi because the latter also has the smoking and fermentation with a mold. While not the same, it’ll do in a pinch particularly if the dashi is only being used as broth. Of course, it’s not clear to me that you’ll get a Sri Lankan ingredient in Croatia either. Thanks for the article. 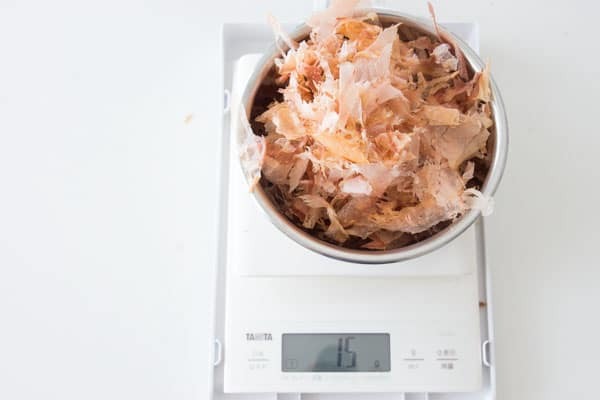 I have been given two whole dried bonito fillets and would like to shave my own flakes for dashi, but I don’t know how best to soften the hard dried fillets to allow shaving. Could you tell me please? Thank you! Hi Barry, lucky you! You don’t need to do anything to the dried fillets to shave them, but you do need a piece of equipment called a kezuriki: http://en.wikipedia.org/wiki/Kezuriki It’s basically a plane (like the ones used for woodworking) flipped over with a drawer underneath to catch the shavings. While dashi made from freshly shaved katsuou is singular, I value my hands too much to risk using one of these things. Please be careful. Marc I just had to tell u! U are so Nice! Hi Susanne, you should be able to “can” this broth by using appropriate sterilization techniques, but unlike most stocks (which can take hours to make), this is very quick, which is why I’ve never found a need to do so.